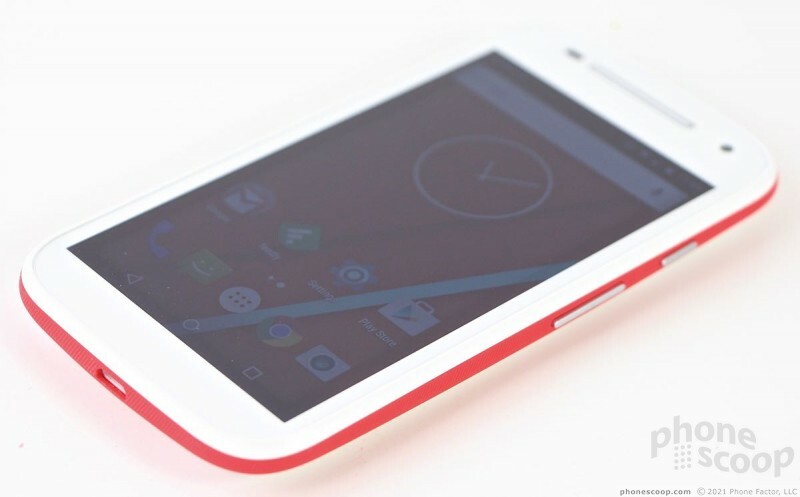 Motorola's second-generation entry-level smartphone includes a bigger screen, faster processor, LTE 4G, and the latest Android 5.0 Lollipop operating system from Google. This budget phone is a steal. Here is Phone Scoop's in-depth report. 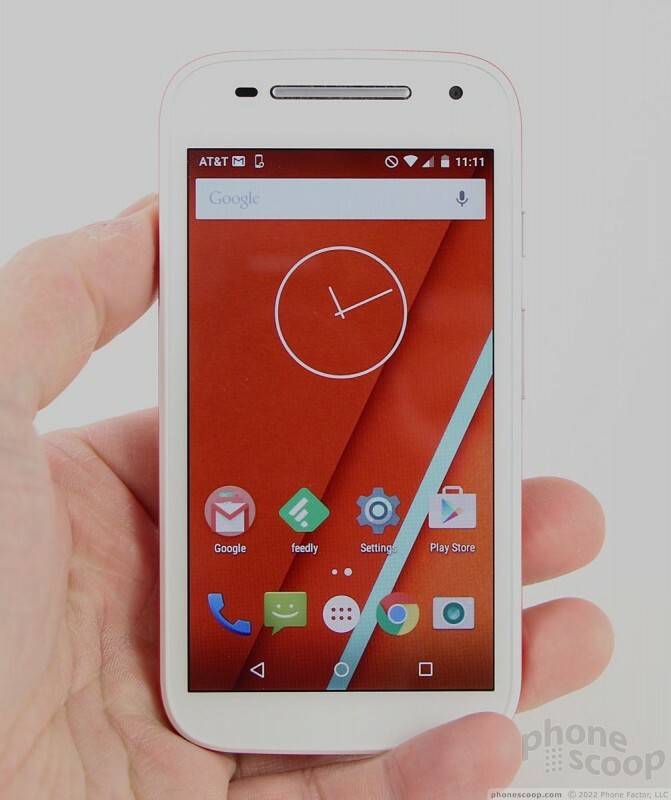 The second-generation Moto E is hardly more than a spec bump to the original device. 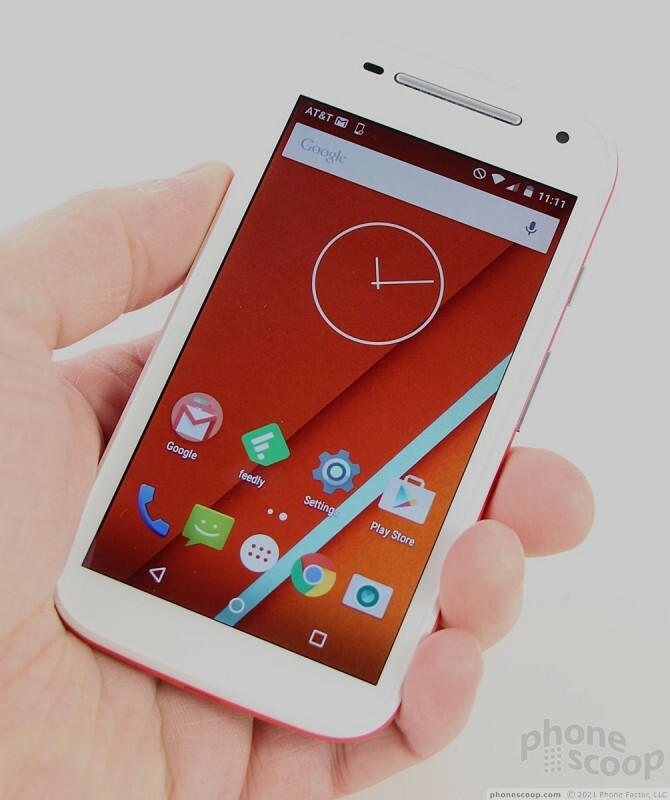 It carries over Motorola's simple design language, near-to-stock Android 5.0 Lollipop operating system, and a very low price point. It's perfect for prepaid carriers. 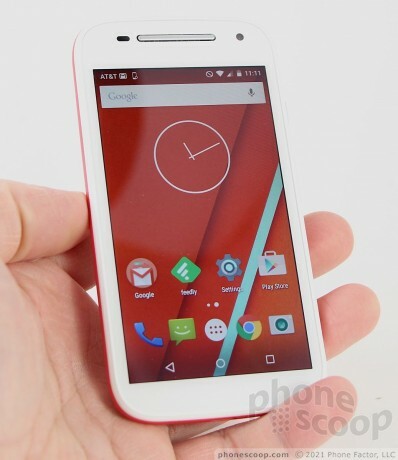 If you're in the market for a high-quality and affordable smartphone, the Moto E is a good target at which to aim. 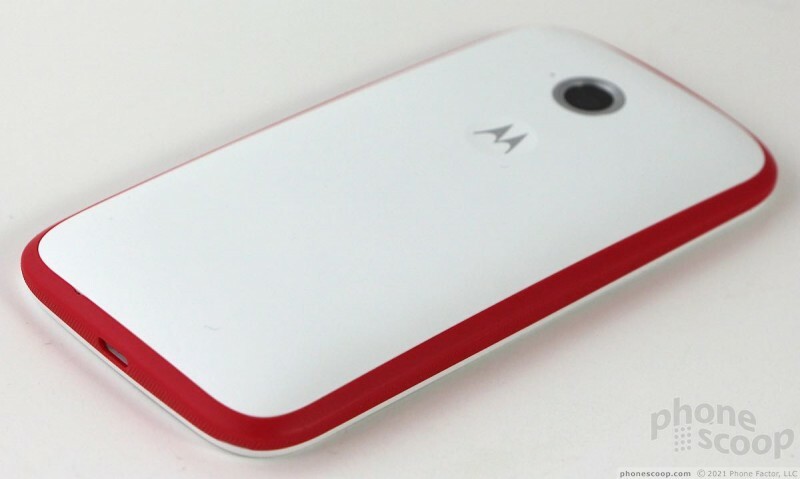 Motorola's smartphones have shared a distinct familial design language since the August 2013 debut of the Moto X. The E has a simple, no-frills look that is at once appealing yet unsophisticated. Don't let the looks fool you; the Moto E packs a powerful punch for its $130 price point. 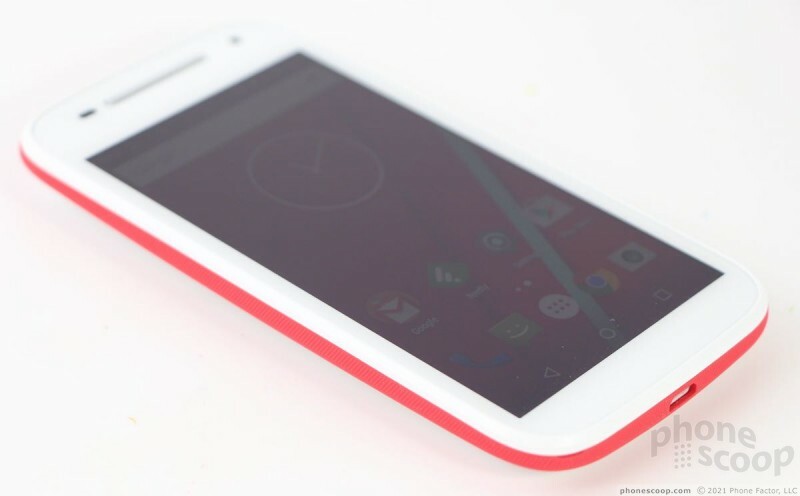 The Moto E is the least expensive and most compact of Motorola's handset lineup, which includes the Nexus 6, Droid Turbo, Moto X, and Moto G. It shares design characteristics with its stablemates, such as the chrome-colored earpiece bar and general shape. The E is a pleasant little phone that comes in either black or white and allows owners to customize the appearance just a bit through the use of replaceable bumpers that line the outer edge. Our review unit is white, but included a red bumper that gives the phone a happier look than the solid white appearance offered. 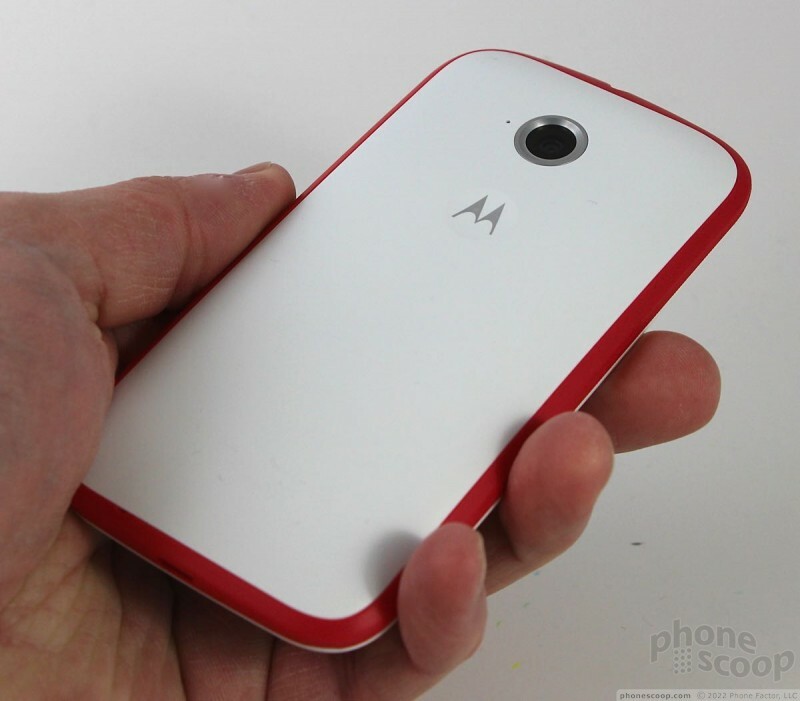 Most people will appreciate the Moto E's size and shape. 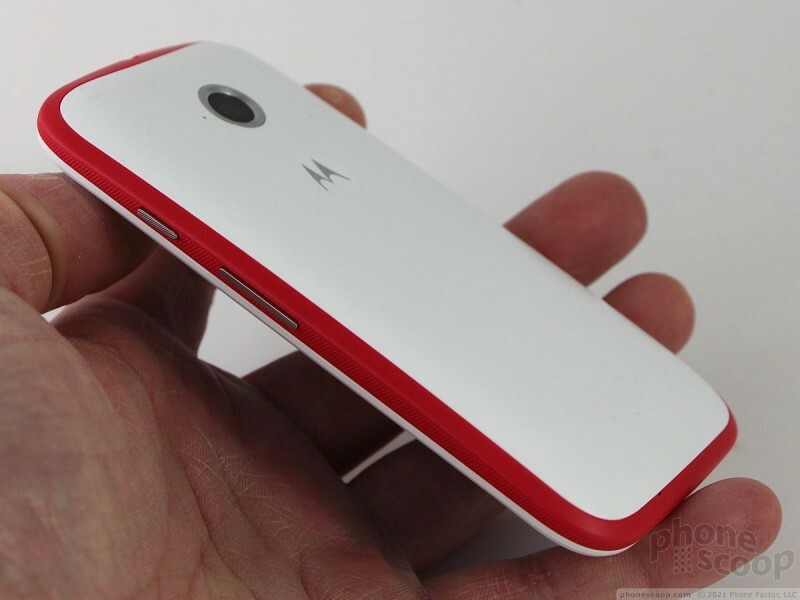 The smaller screen (4.5 inches) allowed Motorola to keep the height and width in check, but the phone is somewhat thicker than today's flagships. 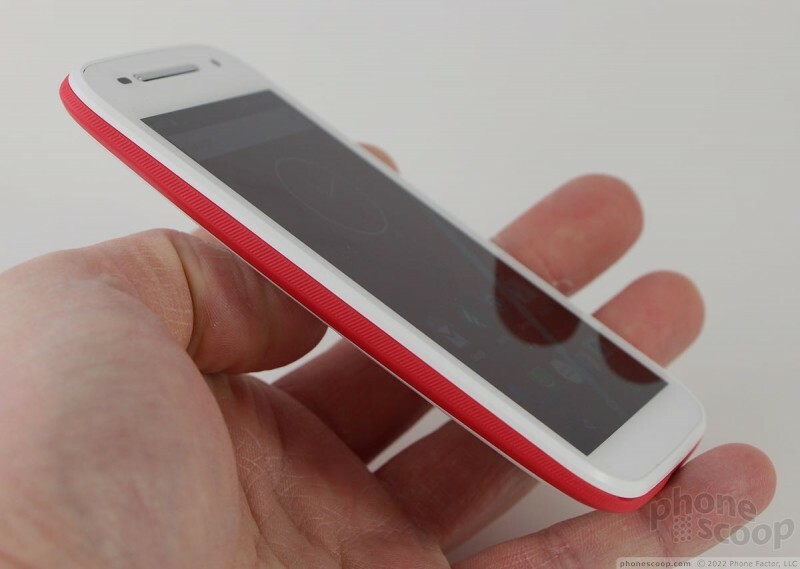 The back surface, made from polycarbonate, has a comfortable curve to help the phone sit deeper in your palm. I found the phone easy to hold and use. It drops into pockets with no problem. The body is all plastic, save for the screen which is protected by glass. The removable bumpers are a bit flimsy on their own, but attach to the device snugly. It's a cinch to swap them. You'd never guess they are removable, as the seams fit together tightly. The entire device has a nice weight to it; it feels solid, but not overly heavy. I am pleased with the quality of the fit and finish, especially at this price point. Plenty of bezel surrounds the screen on the E's face. The bezel isn't as noticeable on the black model, but the smallish display stands out plainly on the white model. The chrome earpiece cover is joined above the screen by a user-facing camera and sensor. 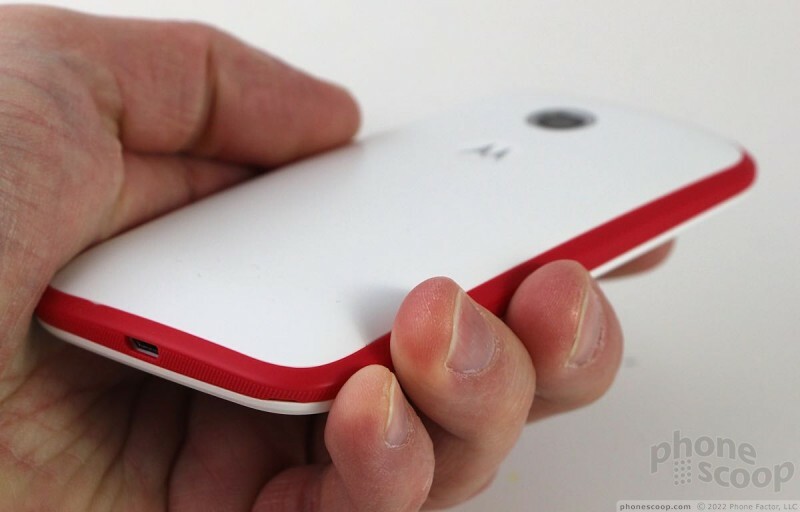 There are no physical or capacitive buttons for the Moto E, which uses on-screen controls to manage the Android operating system. There's a slight rim where the glass meets the polycarbonate frame. It's hardly noticeable, but will give the glass a little bit of protection when the phone is placed face-down on a flat surface. There are no controls or buttons along the left edge of the phone; you'll find the screen lock button and volume toggle both on the right side. They are built into the bumper and have excellent profiles. The silver color contrasts with the red/white color combination nicely. The lock button has fantastic travel and feedback, but the volume toggle is a bit squishy in my opinion. The headphone jack is on top and the microUSB port is on the bottom. 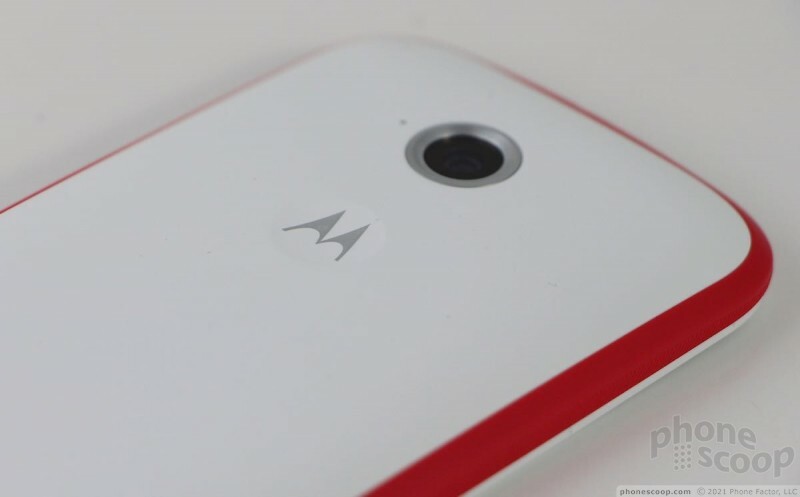 Some may dislike that the Moto E's battery cannot be removed. The SIM and memory card slots are hidden under the removable bumper. 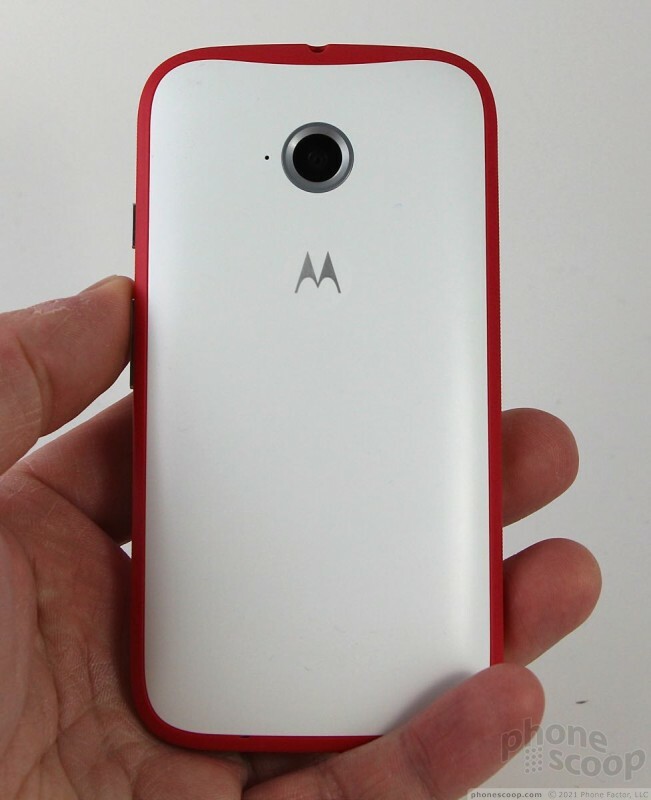 The E sports the stylized "M" Motorola logo in an indentation on the rear surface, just like Motorola's other phones. The circular camera module is positioned near the top. 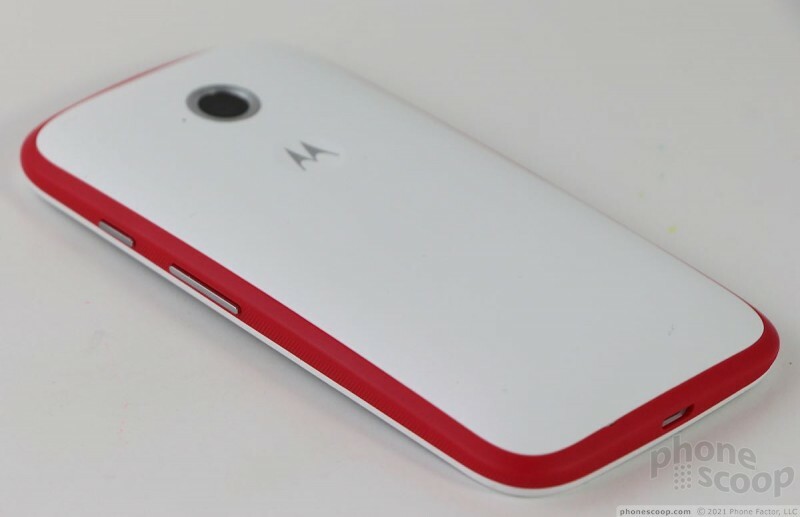 The Moto E isn't perfect, but I don't think any phone company makes a better piece of hardware for $130.